El Morro, whose full name is Castillo de San Felipe del Morro, is one of the early military garrisons built in the Caribbean to shield Spanish American cities and their ports from attack by foreigners. The thick walls, which jut into the sea, were built for strength and protection. Their forms, functions and aesthetics were established largely by military engineers. The walls of El Morro were designed to protect the Bay of San Juan from raids by foreign pirates and military parties. In places, they are 18 feet thick. The primary attackers of San Juan and other Spanish American port cities in the Caribbean were British and Dutch. Along the tops of the walls, one can still see the slots for cannons. Originally, in the 16th century, only a few existed. Over time, as the walls of the fort were enlarged, more cannons were installed, some of which faced the Bay of San Juan, others directly into the Atlantic Ocean. On the ground, there are semi-circular tracks, made by the wheels of cannons, which could be rotated to better protect the fort walls. 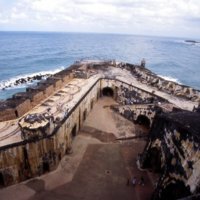 King Carlos V (ruler of Spain, 1516-1556) commissioned the first structures of El Morro in 1539, which include parts of these these walls. The engineers Juan de Tejada and Juan Bautista Antonelli laid out the main design which, over time, changed and grew under different the guidance of colonial officials. Stone is the primary building material. Founded in the 16th century, today El Morro is a U.S. National Historic Monument (since 1949), and United Nations World Heritage Site (since 1983). 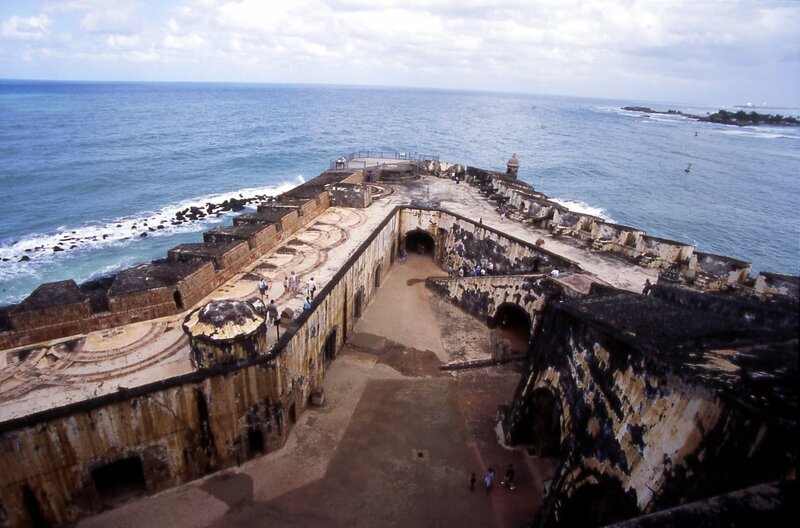 Built as a military fort, at the mouth of the harbor entering San Juan, El Morro suffered repeated attacks by foreign forces, both British and Dutch. Its history is thus intertwined with the political, economic, and military need to protect the Caribbean cities of Spanish America, from Havana and Santo Domingo to San Juan and Saint Augustine. El Morro. National Park Service Guide . Alegría, Ricardo E. 1969. Descubrimiento, conquista y colonización de Puerto Rico, 1493-1599. San Juan de Puerto Rico. Calderón Quijano, José Antonio. 1996. Las fortificaciones españolas en América y Filipinas. Madrid: MAPFRE. El Morro. National Park Service Guide. National Park Service. 1996. The forts of old San Juan: San Juan National Historic Site, Puerto Rico. Washington, D.C.: U.S. Dept. of the Interior.